With all the importance and coverage to given picture apps, one integral part of photography is completely side-tracked – the proper customization of photo effects using the vast spectrum of colors to their full potential. But we bring to you a wonderful Android app named Color Splash Effect that offers this missing functionality and promises to take the creative appeal of your pictures to a whole new level. This Android app takes photo-editing a step forward for you to explore what all you can do using it in the photo editing world. This is one of the coolest effects that one can to their advantage. The Color Splash Effect app actually makes a relatively boring picture come to life. As the name throws out, Color splash is an effect you can give to your pictures by throwing a wide range of colours onto the picture. Its working mechanism is simple and is based on the following assumption. Black and white color scheme is an integral part of photography and so is color photography but if one can blend the two into one picturesque effect it brings out a beautiful picture in the whole. It converts the picture to black and white yet remembering the color scheme of the original picture used behind. The following features are contained within this app. 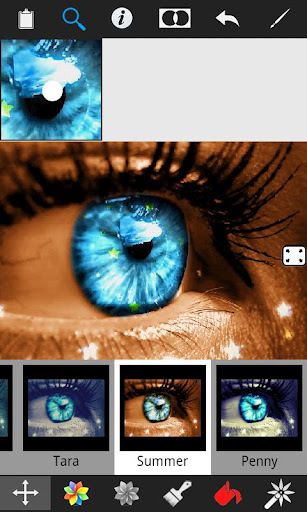 The app contains 37 unique and creative filters ranging from Sunlight, Neon, Sura, Tara, Summer, Penny, Cuddy etc. You can save multiple files for editing them later in case you don’t have time at the present moment. You can add a multitude of borders and frames to add spark to your final picture. You can not only play with black and white and the original colours of the photo but also Edit the colors of your photo to add any other color if your choice. i.e. convert a picture to black and white and then add in your own colors instead of reinstating the colors that already existed to add effect. The app contains 4 different brushes: Hard or Soft Edged and Opaque or Transparent to give further detailing to any picture. The app comes with a Tablet friendly UI (including the Nexus 7) so that gives you a larger screen and an advanced platform to edit your pictures. Vignette filters are included as well and you can adjust the brightness and contrast and a lot more detailing features to get just the right effect. Undo any number of changes made and go back to where you originally were in case you made a mistake or are unhappy with the given effect. and export photos to Twitter directly through the app. 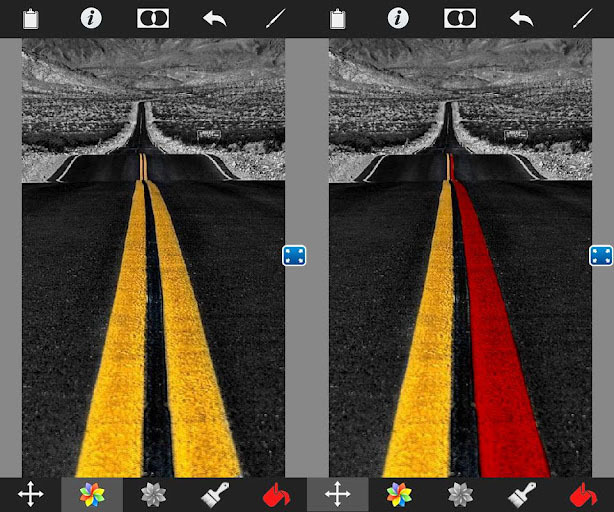 This nifty and artistic Android app also supports high res. images, unlike many other apps in its category. Even though Color Splash Effect has also not been discovered by a particularly large number of users, it has still managed to gain a 4.4 star average rating so far. This truly does add credibility to the app and is a sure shot download. It’s available in the pro/paid version as well. And after trying the free version, if you are lured into paying for more advanced feature it is only but warranted for.